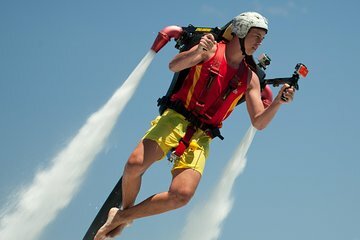 Unleash your inner daredevil with this exhilarating 30-minute jetpack, flyboard or Jetovator experience at Main Beach on the Gold Coast. Feel a surge of adrenaline as you blast off from the water and propel yourself up to 45-feet (14-metres) in the air using high-speed water jets. Best of all: full instruction and safety equipment is included, and no experience is necessary, so anyone can give it a go!